Thank you for your interest in Gas Analyzer. Please complete and submit the form below and an ADInstruments representative will aim to get in touch within one working day. If you’d like to speak to someone immediately, office contact information is available from the contact page. The Gas Analyzer allows the continuous measurement of respiratory gas concentrations from rats through to humans. The Gas Analyzer allows the continuous measurement of respiratory gas concentrations from rats through to humans. It houses an infrared carbon dioxide sensor and optical oxygen detector. The CO2/O2 respiratory gas analyzer samples expired gas from a mixing chamber with a damped, micro-vacuum sampling pump. A flow control knob on the front of the unit provides sampling rates of 35 to 200 ml/min, although maximum flow values may vary for different sizes and lengths of tubing. 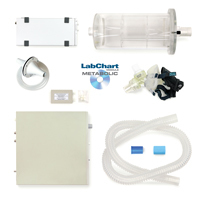 Variable sampling flow rates from approximately 35 ml/min to 200 ml/min. An in-line filter attached to the sampling port of the Gas Analyzer to protect the transducers against moisture and damaging particulates. An infrared CO2 sensor and an optical O2 detector fed from a damped micro vacuum sampling pump. Automatic calibration of the CO2 and O2 channels when connected to PowerLab. Sampling system: One CO2 and one O2 transducer fed from a damped, micro-vacuum pump. Gases: Must be non-corrosive and non-flammable. A moisture removal scheme must be employed before the sampling inlet. System sampling flow rate: Approximately 35–200 ml/min (user variable). Moisture filter: It is recommended that a 0.45 μm hydrophobic membrane filter be fitted before the sampling inlet.